I have been using a new menu for the last week. The only item on the menu is “Eat That Frog”. Yes…Just stop procrastinating and do what you dread. 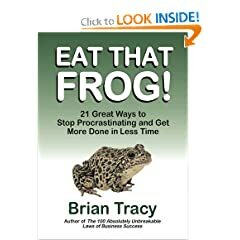 I read “Eat That Frog!” by Brian Tracy this past summer and it truly did motivate me, most of the time. We took a family trip to the Smoky Mountain recently and I found some little green frogs with a bell inside. I bought one for everyone in the office and asked them to put the frog on their desk. We all had to admit that we had certain duties that we dreaded and we would procrastinate in getting them done. All of us began looking down and seeing the “little green frog” and it was a reminder to “eat that frog” the first thing each morning. Sometime we will all just say we have to “eat that frog” today and dive into the project. I had been procrastinating on some jobs at home and I had to “eat that frog” at home also. You know…that drawer that needs organized, the closet that needs cleaned, organizing your home office, getting receipts ready for 2008 taxes (yuck). I have worked for several days over the last two days and most of my documents are ready for IRS. I “Ate That Frog” and I feel good. Please follow this link http://eatthatfrogmovie.com/ and you can watch a short movie that will be helpful. Would you like to “eat that frog” ? This was a terrific idea. I have heard of this before, but hadn’t thought of it in a long time. I am a great procrastinator. I love the idea of having a green frog on your desk. I have a green frog and I will move him to my desk. Loved the movie. Well done. You might check out my inspirational blog today. What a great idea! We all need to be reminded of this every day. Each morning when sleeping in might cross my mind, I remember I need to feed the critters before I can sit down and enjoy my own breakfast. I try to teach this to our son, too – get your school work done and then you can go out and “play.” Such a simple lesson, but one we struggle with our entire life, don’t we? I just now found your site for the ranch. I am going to post your links on my blog and you should get some more traffic. You have my permission to put my blog on your, if you wish. I just love visiting your sites and looking at those pictures. My head would love to visit there, but I am not sure “uncle Arthur” in my legs would be cooperative. Do you have to ride a horse into the ranch or can you drive a car in during the Spring and Summer? Your son looks just like you. That’s a pretty interesting way to think about it. I guess, most times, when we just get right down too it, things aren’t as bad as they seem either. I can dread stuff all day long but when I just do whatever it is, it’s suckh a relief. Shoot, it tastes like chicken right!